Hallstatt was supposed to be a rest stop half way through the trip. My train from Vienna arrived at the teeny station on the Hallstätter See directly across from the town. I had made the acquaintance of Sylvia from Guatemala and Jun Song from Korea. We marched down the trail to the waiting boat to takes us across the lake to Hallstatt nestled against the Austrian Alps. It was a fine day with sun and few clouds. I said farewell to Sylvia and Jun Song to go tend to my room at the Gasthof Simony, which was a hundred and fifty year old pension with a lakeside view. My hosts didn’t speak any English but were kind and showed me to my room. I then decided to set up my rather curious computer system, which I had brought for editing and saving my visuals. I had planned to do a bit of work while taking this little break from interviews and puppets. Then I looked at my screen, separate from my computer, it looked like a close up image of some leaves against a white back drop. It wasn’t. I pressed the screen. They were smearing. The screen was dead. I would have to buy a new one as soon as I got to Switzerland. More money down the drain. And I thought about it for a few minutes, then rejoiced. I didn’t have to work anymore. This could really be a break for me. I was free! 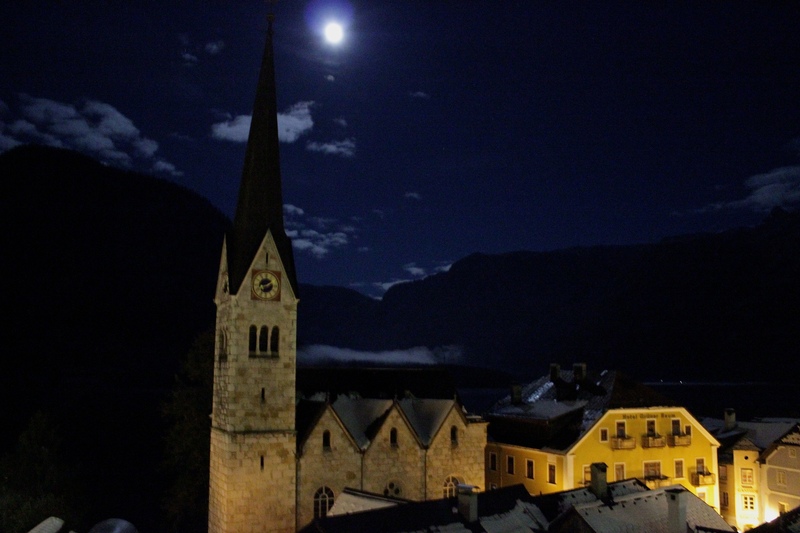 And so I left the pension to head into the quiet of a very late nearly end of the season Hallstatt. I bumped into Sylvia and Jun Song again. I took them up the funicular rail to the salt mine. Sylvia almost didn’t go. But I told her, just spend the money and thank me later. She did both. I won’t stop to tell you about the mine tour etc. If your ever in Hallstatt just go. But I will tell you this. Both Sylvia and Jun Song were gone by 6 in the evening. Neither stayed the night. Hallstatt was just a passing stop for them. And they were not alone. Last time I was in Hallstatt, in 2005, I stayed three nights. I loved it. It was the vacation inside of my vacation. But I was disturbed by the fact that most people were leaving after one day. But now for many people Hallstatt was a pitstop on the way to Salzburg or Vienna. In all fairness Jun Song did say he wished he had stayed the night. Some people did spend the evening with me in Gasthof Simony and that’s it. One night. It’s almost as if people come and say ‘What do you do here?’ Salt mine. Check. Bone church. Check. Walk through quaint town. Check. Eat at a cafe. Check. We’re done. Let’s go. Let’s find something much more distracting. Speaking of distracting: I came down in the evening to see if anyone was hanging out in the main living area at the pension. A couple of Asian guys were sitting quietly making ritual motions with their hands over some sort of advanced cellphone device. 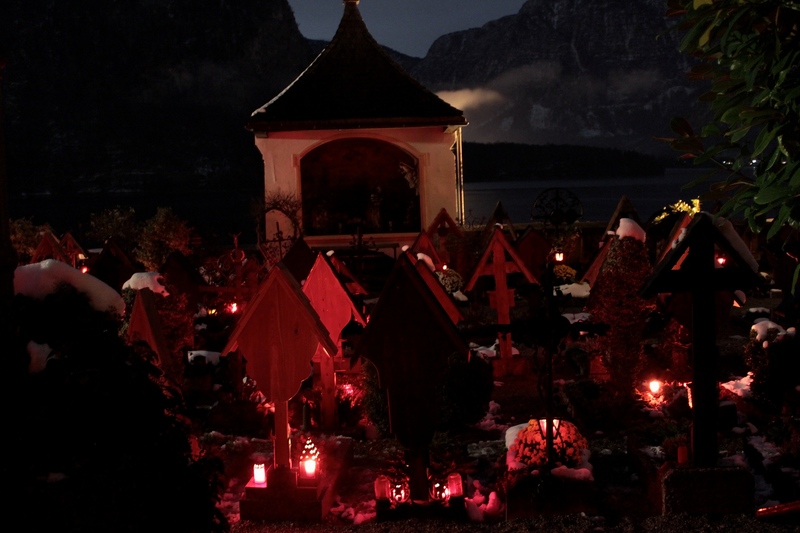 When I say Asians I specifically mean Koreans, Japanese and Chinese all of whom seemed to have Hallstatt rated high in their Austria guidebooks. I heard one girl say to her guy. There’s nothing to do here. True enough on the evening distraction front. Most of the restaurants were closed. There was a smoky local’s cafe but that certainly wouldn’t look too inviting. Apart from the fact that there was an incredibly bright full moon over the lake making the mountains shine above their reflections in the rather pleasant weather in the middle of the Alps… there indeed was nothing to do. I had to get out, take a walk. I took a few photos, but really this was quite a sight and hard to capture. I pretty much had the town to myself. Though I’d guess there were perhaps a hundred people in all of the hotels. When I returned an hour later the Asians were still making curious signs on there mini-screens. 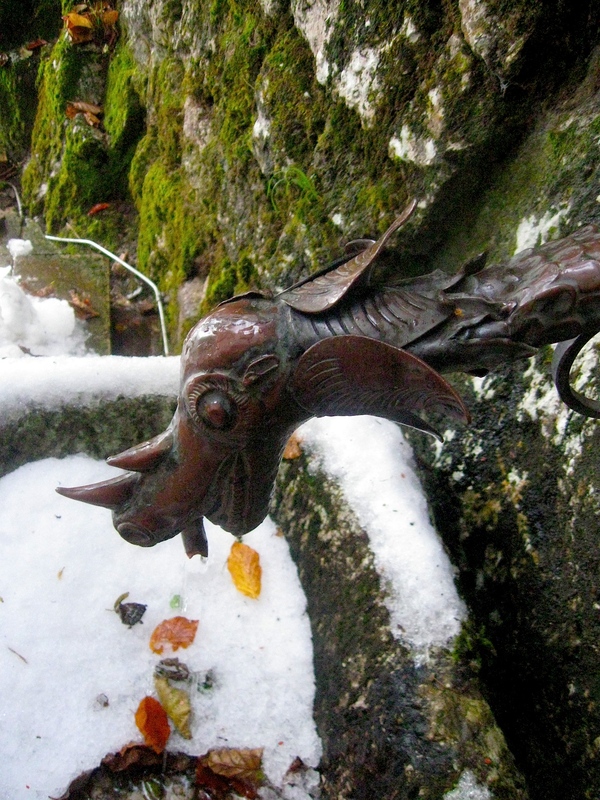 No Puppets in Hallstatt but I did Find this Gargoyle Waterspout, Strange Wood Carvings in the Mountains, Various Shrines with Statues and the Chapel Full of Bones. And I realized it wasn’t just Asians. It was everybody. In Poland and the Czech Republic. In Germany and Austria. In Alaska as people walked off their cruise ships surrounded by the majesty of the mountains. Rituals with fingers on little screens. Who needed a real computer like mine? Who needed a laptop? Oh arcane early 21st Century fool! Who needed a camera? Who needed to actually be anywhere? 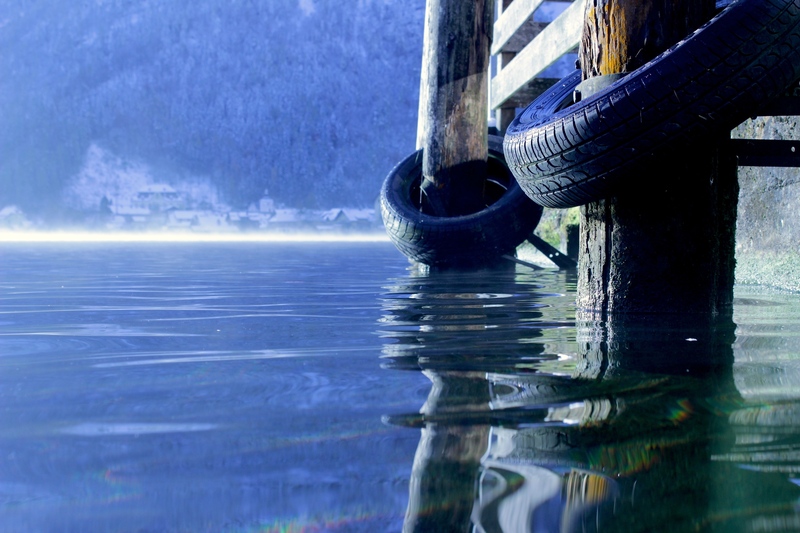 How could a full moon in the mountains on a lake compete with the convenience of connectedness? And when we travel now? Are we in fact anywhere at all now? Or is everything becoming, like the shopping malls, the same place. The next morning I waited for the boat. Which never came! I watched the train stop across the lake without me. Then I realized that this was All Saints Day. A holiday in Austria. The boat did not come for two more hours. And because of that all of my connections were thrown off. But it was a challenge to try to make up time along the way to Switzerland. I was due in Luzern. I had folks waiting for me. But in the end it all worked out. In Lucerne I met Christos and Deena who were putting me up in what would easily be the swankiest lodgings of my trip and had scheduled a meeting with a Swiss producer who understood the ins and outs of Swiss production. I spent a day in Luzern taking care of business. And that business included buying a new screen for my computer and shipping off about five kilos (ten pounds) worth of backbreaking books home. The two purchases set me back about $200 US. But that was pretty much par for the course. I strolled around Lucerne thinking that the Swiss have so much money. And all of the stores seem to cater to top of the line items. The Swiss don’t do cheap. Their currency is one of the strongest in the world. And I felt like a visitor from a third world country. I was told that a low level job at a Starbucks might pay as much as forty thousand or more here. This is one thing I really loved in Lucerne. 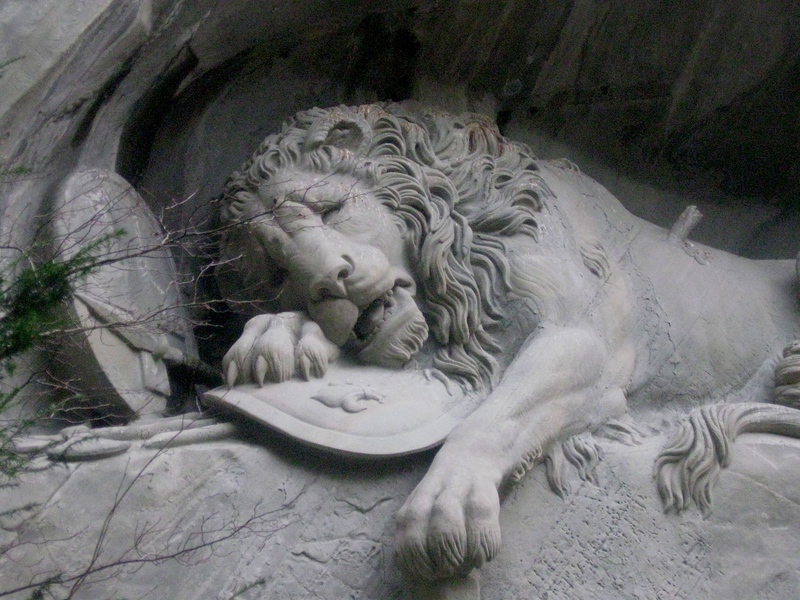 The Dying Lion. The meeting in Zurich with the producer went well. The project seemed quite viable to the producer. He gave Christos, Deena and I good advice for going forward. It is business talk. And I shouldn’t discuss business here. But things felt good. Something indeed might come out of this. And that felt like a vindication of what I have been doing for quite a few years now. I left Zurich with a lighter load on my back. A lighter wallet. And a sense of lightness about the project. Now on to something completely different in Huémoz Switzerland.